Here are some views of the finally finished three panels for the hospital. Each one is 3 feet by 4 feet and the top photos shows most of it - couldn't quite get back properly to get it all fully in. I call it "An Artist's Richmond" - and - as you see- it is not total reality - lots of omissions, exaggerations, and general fun. I wanted to make a set of paintings that would be fun to view and would take a person's mind off stressful thoughts. It has been a real challenge to research and paint - and very time-consuming since there are so many details with tiny brushes on such large canvases. Why the dots? They are there to make it magical and to make it clear that is not a realistic map. In the second picture above, there is the fishing pier and I thought it would be fun to have a cat fishing too. There are lots of artists painting all over - and you will see that they are all wearing green aprons such as the Men in Hats plein-aire group wear. A lot of suburbia has been left out - and where it was needed for spacing, there are large bird portraits of the various species found in Richmond.The third picture above is of the slide at the new children's playground - with a Yellowhead blackbird looking in from the sharing farm next door and garlic ready for the festival. The last picture above has the West Dyke with Scotch Pond, a birdwatcher, Harold Steve's house and his belted cattle, a Redwing blackbird and his less brilliantly plumed mate, the eagle tree, the bush where the little owls were - and the snow geese- no room for the Snowy Owls who are over on Sea Island. - but the English Sparrows and a tiger swallowtail butterfly are nearby. - so this is some of it - and I'll probably post more photos in the next blog. 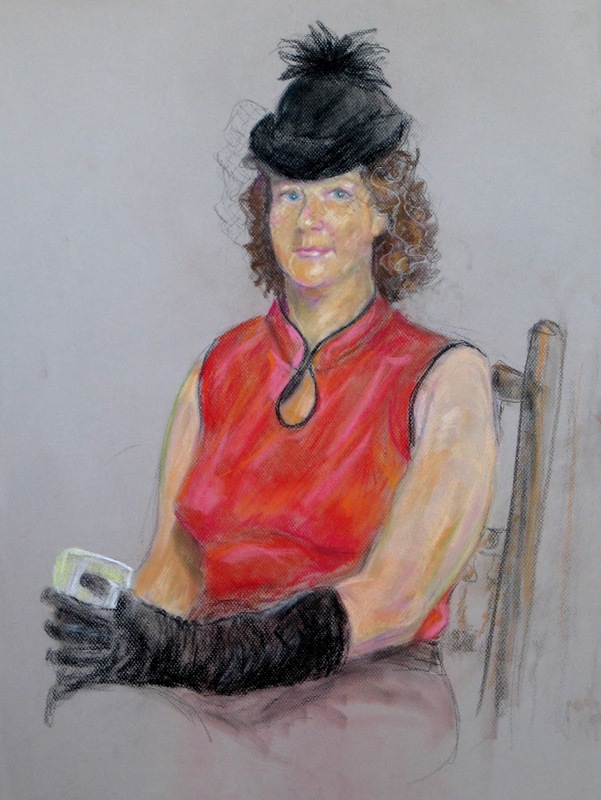 Here is the rest of the pastel I used on October 2015 Art News. Any guesses what Helene was holding? I no longer remember- it may have been a little camera. I used this image as I haven't yet photographed what I did in the workshop taken at the beginning of the month- which was painting the clothed figure. I like this pastel because it captures Helene's playful spirit as she poses in her aunt's hat from the 1940's. I'm currently getting organized for GuessWho? which we will be holding on November 7th at the Pioneer Church, South Arm United at #3 and Steveston Highway -from 10 am to 3pm with viewing only for the first 15 minutes. All paintings are 10x10 on thick canvases so they can be hung to make a nice grouping. I will have three paintings in this sale and they are all different - so I wonder if you will recognize my work??? All paintings sell for $100 each - some are by high-school students so you may be buying the next BIG NAME - and some are by current big names whose work sells into the thousands. You may be making a good investment- although I feel that if you really enjoy a painting, you have your return on your investment right there. The nicest things I've had said to me are when a person tells me how much they are enjoying something I painted and sold some time previously. It is a great chance to do your Christmas shopping out of the rush and end up with individual one-of-a-kind gifts. Of course, you might just fall int love with your purchase and end up gifting yourself!